(CNN) - The Democratic National Committee continued its offense against Mitt Romney with a new web video on Tuesday, pointing to comments he made nearly 10 years ago saying he held "moderate" and "progressive" views. The remarks, which he made as a candidate for Massachusetts governor at the time, made a splash when they resurfaced online Tuesday, and the DNC quickly pounced to turn them into an ad targeting the GOP presidential candidate. 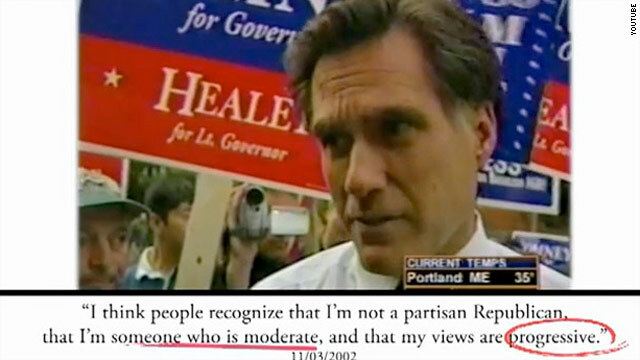 "I think people recognize that I'm not a partisan Republican, that I'm someone who is moderate, and that my views are progressive," Romney told reporters in Worcester on a campaign stop in 2002. Highlighting the quote, the DNC video also fast-forwards in time to footage of Romney speaking to the Des Moines Register editorial board last week, in which he described himself as a consistent candidate. "Nothing's changed in my position. I'm just as conservative today as I was four years ago. Maybe more so," Romney said. The DNC showed the two clips to portray a changing tune for the presidential candidate, someone they say is now trying to appeal to tea party voters but who, 10 years ago, spoke in ways attractive to independents. The video ends with text on screen: "If you can't trust Mitt Romney to say what he stands for, you can't trust him to stand for you." The web ad is the latest in a series of videos produced by the DNC for a website called WhichMitt.com, where the group attempts to highlight inconsistencies in the candidate's record. Romney's campaign responded Tuesday saying the last thing Democrats want to do is run against Romney. "That is why they are focused on his campaign and not on the economy. The Democrats are continuing their campaign of deception in their strategy to 'kill Romney.' If anyone has a question of how Mitt Romney will govern as president, take a look at his record of creating jobs, cutting spending, and protecting the sanctity of life and traditional marriage. That was his record as Governor and that will be his record as president," said Andrea Saul, spokesperson for Romney's campaign. Romney seems to be going back and forth between postions depending on the group that he is courting. Why does this not surprise me. Do Republicans remember the "Swift Boat" lies? They made up those lies about events in the Viet Nam War! The Karl Rove crowed invented this stuff. Your flip-flopper is simply paying his dues for being a "progressive" to win one election and a "conservative" in an attempt to win this Primary. MITTens has just become a "tender" version of General Tso's Chicken – NO ONE flips that much in an entire lifetime!! Dang, if I flipped that much I wouldn't know who I am tomorrow and yesterday is already forgotten!!! I thought he had a poor jobs record did he not? Let's see...there is a word in the english dictionary that aptly describes this behavior. Hmm...its on the tip of my tongue...Ah, yes...DECEITFUL! Yeah, that's the one! "Nothing's changed in my position. I'm just as conservative today as I was four years ago. Maybe more so,"
Wow, Flipper; you can't even defend yourself without flip-flopping from one sentence to the next. It has become apparent that you are utterly lacking in self-awareness, which is why people correctly perceive you as arrogant, elitist and untrustworthy. One of many videos the DNC will use. LOL. Romney is the gift that keeps on giving. Master flip flopper. The Democrats are worried about Mitt Romney. He polls the best against President Obama. The Dems are worried since their President has the worst record of any president in the modern era.